Here is a second show that they have scheduled. 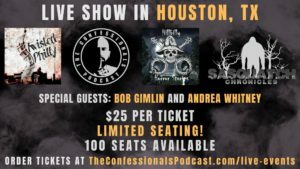 Myself and Bob Gimlin will be in Houston May 11th. 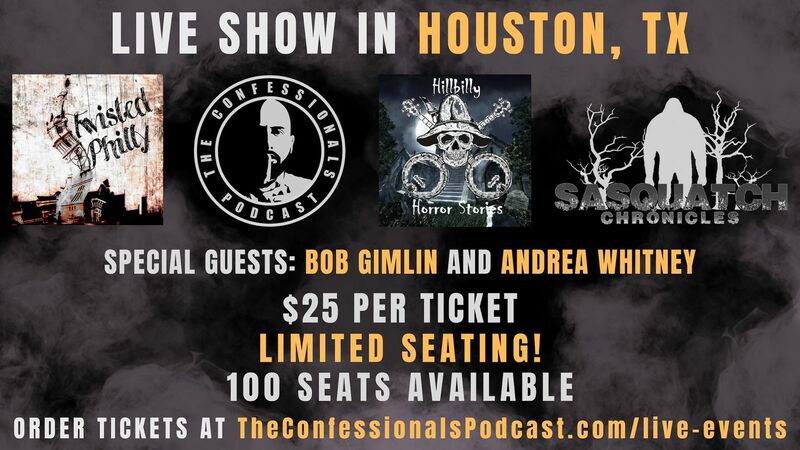 Hillbilly Horror Stories, Twisted Philly, Sasquatch Chrinicles & the Confessionals give you a night of fun and full access to all of podcasters. Eat some great Mexican food as you hear stories of cryptids, paranormal and true crime. ~ Sounds positively a hillbilly horror, twisted philly (whoe Nellie) Sasquatch Chronicles with Tony’s confessionals kinda evening. And true that. There’s no better Mexican food north of the border than Tex Mex cuisine. Ya’ll have FUN! I got off cheap with $25, I was looking at plane tickets and hotel stay when I thought I was going to have to fly to the convention to meet y’all lol. It’s awesome your bringing Mr. G and it’s even more awesome you ended up in Houston! 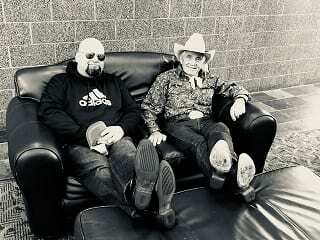 wish i could be there!! Hope you continue this and come to Michigan that would be awesome!! So close yet so far…have an awesome time, Wes! Wish I could make a that. I could check off so much of my “Sasquatch Bucket List”. Have fun! Wes…..uuugh I missed it.. dam I’m from the Houston area but I’m currently working in the Florida panhandle doing hurricane relief work…uuuugh I missed meeting you. So sad but I bet it was awesome…and someday I’ll send you my encounters on my ranch in Florida back in 2006 when on fell out of the tree right into the middle of the road in front of me. Till then love love love your show! Even though I’m close, my friend and I are planning a weekend out of it, can’t hurt to have a night away at the Marriott , lol.